AndyPierce (10k): I hate this shape, but is it actually bad? It seems slow, pokeable, cuttable and, like the BambooJoint, not too good for making eyes. Is there a happier alternative for white in this situation? Bill: looks bad. strengthens White, while making Black heavy. Better tenuki. Maybe Black c, White d, Black e.
unkx80: This is not all that bad. White has a and b to look forward to for settling the shape. (Sebastian:) Sorry if this is a stupid beginner question. But I don't see why , a and b are good. is gote, and the follow-up moves can be cut easily. And if b turns into a ladder, it is not even in White's favour. (Sebastian:) Of course not when I'm black. ;-) Seriously, though: Now you got me really confused. How can we even talk about white follow-ups if there is a black move in between? Doesn't that change the whole picture? ChrisSchack: You said both require a tenuki ... well, that means White will get one of them (more likely a, if White gets b, Black is in trouble on the left, those are weak already). Also, the cuts are more trouble than you think, I think ... can somebody say more on why these are good? They look good to me, but I'm having trouble saying exactly why, with any authority. Andrew Grant: Sorry, but b is dreadful, in my opinion. The very last thing you want to do with weak stones such as and is to attach to them allowing Black to strengthen them. Far from being in trouble, Black will welcome b. 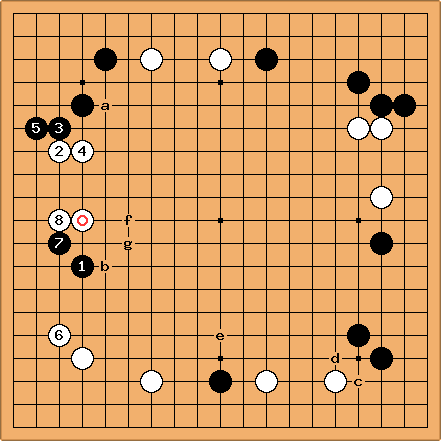 A one point jump to f or keima at g is sufficient to keep White's stones safe and Black under pressure. As for a, this is better as Black's top left is strong already - strengthening it further won't matter. Bill: Just follow-ups or followers will do. Each player has a follow-up in a non-terminal position without a ko ban. Threat or target are also possible. (Sebastian:) Hmm, that page doesn't seem to explicitly limit the term to moves that require a tenuki. Threat, aji, aim, and target all imply a lapse of time, and, hence, tenuki. There is a Japanese term, fukumi?, that refers to something implied, that might apply here. However, fukumi is a synonym for nerai (aim or target). (Sebastian:) After our combined effort of editing that page, it has become clear that follow-up does mean both an immediate follower and a move after tenuki. So if I had written "both are follow-ups" it would not have made my point. Any way to diambiguate the two meanings? Sorry for writing this here; this should go into a FollowUpTalk? page. Bill: Moi, I do not feel the need to stress the distinction, but you do, so why not? It is not like there is a standard term, follow-up. (Follower is standard in CGT.) Go for it. TJ: I think a follow-up implies a line of play which may or may not happen immediately, depending on opportunities elsewhere for tenuki. Generally, when there's a drop in temperature in the local situation, a further line of possible play is a "follow-up". If it must be played immediately (no temperature drop), it's part of the original idea/pattern, and not really a "follow-up". (Sebastian:) I just realized where my problem was and reworded the passage. That is gote is not the fault of the follow-up moves, so there's certainly no separate term needed. Unfortunately, ChrisSchack's reply to my misleading statement now doesn't fit anymore. As far as I'm concerned, we can delete this conversation, but we should probably salvage the link to fukumi and TJ's comment into FollowUp. (Sebastian:) Not when I'm black :-( As a rule, when playing against me, White's moves are always sente. (Sebastian:) How can we even talk about white follow-ups if there is a black move in between? Doesn't that change the whole picture? Bill: The original question had to do with whether White's shape is bad. unkx80 pointed out that White could play at a or b to settle her shape. That has nothing to do with Black's problems with - . Let me amend that. Shape does have to do with context. For instance, a supposedly good shape may actually be overconcentrated if there are no opposing stones in their vicinity. But - could be strengthened, say, with Black stones in the lower left instead of White stones, and White would still have the play at b. (Sebastian:) Now I'm beginning to see what you mean. I understand your point that the white shape is good because it is both appropriately concentrated in its context at the moment and has potential for the future. But how can we discuss without considering ? Because we're assuming "Black will reply somewhere, probably to the south of its - group, so that we can just ignore that move for our considerations"? This does make sense for a, but with regard to b it seems sloppy to me. Bill: A couple of things: First, go tends to break up into independent or relatively independent regions. Even if two regions are not independent, often play in one will have only a minor effect on the other. In any event, analyzing local regions is a first step to a more comprehensive analysis. Since tenuki is always an option, you cannot be sure who will play next in any region. Your analysis should include both possibilities. "First form your ideal picture on the supposition that your opponent does nothing." The point, really, is how to deal with our bounded rationality. Tic-tac-toe succumbs to brute force analysis by humans. Go moku, chess, go, etc., do not. Analysis in go that does not ask, if , what about , is not sloppy thinking. It is an essential aid to our imperfect understanding. (Sebastian:) Interesting! It sounds like if I learned this (and its limitations) I could grow by one kyu or more. This merits to be moved out of this footnote into a topical page. It reminds me of the advice "Follow your dreams!". Maybe fully understanding it even helps to find the right balance in real life?